West Yorkshire children who wouldn’t normally enjoy a summer holiday can get away from it all next year thanks to the fundraising efforts of students at The Grammar School at Leeds (GSAL). Local charity SVP Leeds & District Children’s Camp is the beneficiary of the school’s first ever Prefects’ Week fundraiser. The five days of fun activities led by sixth form students at every break and lunch time raised over £900. The camp, part of the St Vincent de Paul Society, has for the last 75 years hosted children from inner city areas for a holiday allowing them to relax away from the day-to-day concerns of their home lives. For the last 30 years the holiday has been a week’s camp in the Yorkshire Dales, thanks to a team of dedicated volunteers, both adults and young leaders. 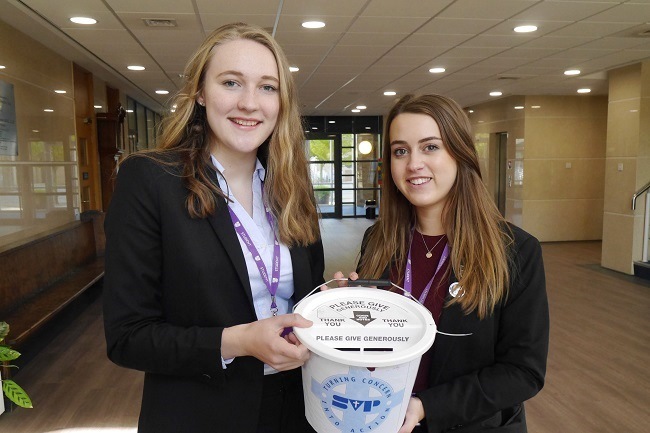 Year 13 students Beth Jordan and Holly Tunstall volunteered at this summer’s camp as junior team leaders, and proposed that the fundraising week should support the charity. During their week under canvas near Skipton, around 80 children aged from eight to 13 enjoyed activities including swimming, games and sports, walks in the Dales, a trip to Lightwater Valley and the nightly entertainment Camp’s Got Talent. To raise the money, sixth form students set up their own ‘raise and give’ week. In return for donations, students enjoyed sponge the teacher, karaoke, a treasure hunt, a dance show and a football v hockey match, and subjected their teachers to a Paxman-style grilling at GSAL’s own University Challenge.